Ozwin's Jackpots: the 5-reel, 20-payline slot sees Ozwin’s trusty apprentice weave spells in an attempt to bring back the mighty magician to his human shape – in exchange for big wins. The game sees players collect crystals to restore the orbs of power and take a shot at 5 different jackpots. It also features the Spellbook bonus game, with extra crystals and bounties on offer. The jackpots fall regularly and more often than other multi-jackpot games, ensuring players remain engaged not just by the title’s visuals and audio, but also by the chance of winning big. Open the Spellbook Bonus Game to get extra crystals and other bewitching bounties. The bonus is activated by landing on 3 or more Spellbook symbols. Your aim is to collect crystals in order to activate the Jackpot Free spins feature. If you’re lucky enough to land on 4 or 5 of these symbols, you will also get 50x to 500x your initial stake respectively apart from access to the feature. Collecting 5 crystals will trigger exciting free spins feature. But beware: the forces of evil will also be at play, since the game will end if you uncover an evil spell underneath one of the spellbooks! 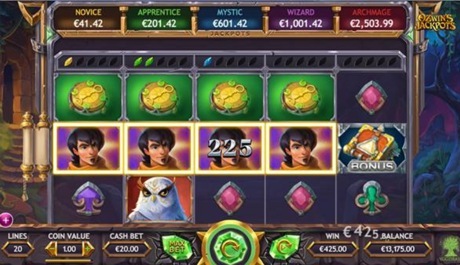 You can either collect 5 crystals from the Spellbook Bonus Game, or land on 3 or more Free Spins symbols during the base game in order to trigger the Free Spins. You will be awarded with at least 10 free spins that come with a 3x win multiplier, whereas 4 or 5 (free spin) symbols will award you 50x or 500x your stake on top of the free spins!